Pleural effusion: Collection of fluid in the intrapleural space, with compression of lung tissues. Fluid collects by gravity in dependent areas of the chest. 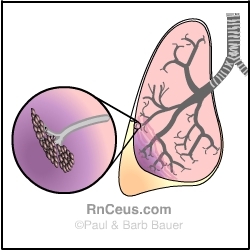 The diagram above, shows pleural fluid compressing lung tissue and alveoli. tactile fremitus decreased or absent. chest expansion decreased on the affected side. breath sounds and voice sounds decreased or absent. bronchial breath sounds and bronchophony, egophony, and whispered pectoriloquy may be heard over the area of the lung that is compressed near the effusion.